Edward Barber Leeder was born in 1897, the son of Mary Leeder. He was baptised on the 4th April 1897 in Swanton Novers parish church (see Figure 1). Edward enlisted on 1st September 1914 at Newcastle upon Tyne with the Border Regiment, and gave his age as 18 years 6 months. He gave his occupation as ‘miner’, and place of residence as Blyth on his enlistment papers. However, as he was born in 1897, he was only 17 years (and 6 months) old on enlistment. He did not remain with the Border Regiment for very long, as he was discharged on the 13th November 1914 under the King’s Regulations K.R. 392 (iii) (c) ‘not likely to become an efficient soldier’. Edward then joined the Royal Navy on the 5th February 1915, giving his date of birth as 28th February 1896 (making him 18, when he was still only actually 17), so it appears that Edward was in fact born on the 28th February 1897 (he presumably just added a year to his age in order enlist in the army and then the navy). His Seaman’s Service Record notes that he was 5’ 3” tall, with a chest measurement of 35½”, and that he had brown hair, blue eyes and a ‘fresh’ complexion, and his occupation is given as ‘miner’. 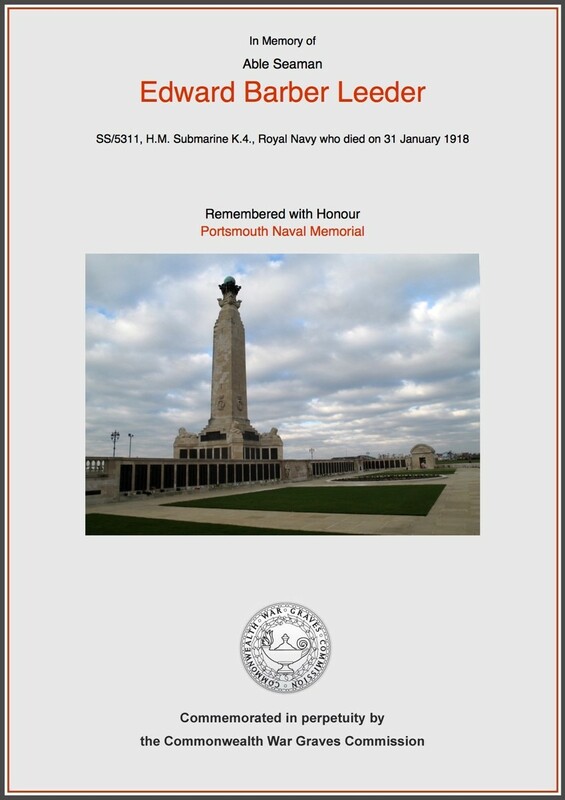 Edward served on five vessels between February 1915 and August 1917, and was promoted from Ordinary Seaman to Able Seaman towards the end of 1915. On the 24th August 1917, he joined the submarine K-4, (see Figures 2 and 3) a British K class Submarine, which were around 339ft/103m long, driven by oil-fired steam engines, and notoriously difficult to manoeuvre. K-4 was built by Vickers (Barrow-in-Furness), and commissioned on the 1st January 1917. Figure 2: K-4 pictured in harbour. HMS Barham, HMS Warspite, HMS Valiant (plus destroyers). Initial visibility had been good, but nearer to the Isle of May visibility was hampered by a sea mist and the vessels had been ordered to maintain radio silence and extinguish navigation lights as they made their way to join the fleet. There then followed a series of unfortunate collisions. Two submarines in the first flotilla (K-11 and K-17) found themselves bearing down on two small vessels (possibly minesweepers) and changed course; a third submarine, K-14, veered to avoid colliding with the two small vessels but started to circle out of control as her helm jammed; at approximately 1914 hours she was then rammed by K-22, bringing up the rear of the first flotilla. At around 1943 hours, the cruiser from the second flotilla, HMS Inflexible, collided with K-22. 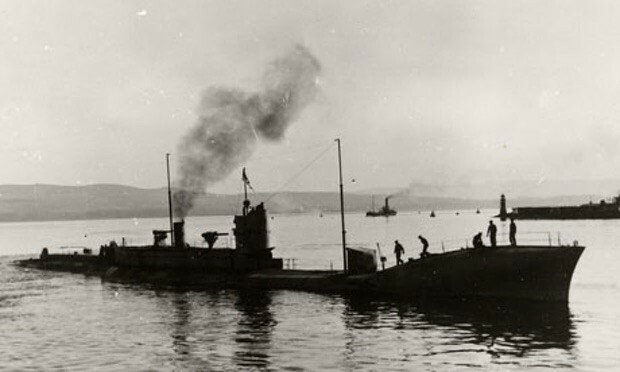 At around 1940 hours, the remaining vessels in the first flotilla – HMS Ithuriel, K-11, K-17 and K-12 – had turned back towards the site of the collision between K-14 and K-22. Unfortunately they only added to the unfolding debacle, as they were sailing into the path of the third flotilla led by HMS Fearless. At around 2032 hours, HMS Fearless, unable to avoid a vessel crossing in front of her, collided with K-17. K-17’s crew abandoned ship; the submarine was lost and she sank in around eight minutes. Meanwhile K-4 had been brought to a stop in response to Fearless’ warning sirens. K-6, part of the third flotilla, mistaking the lights of K-4 for K-3 (which she had been assiduously following), found themselves bearing down on the stationary K-4 instead. 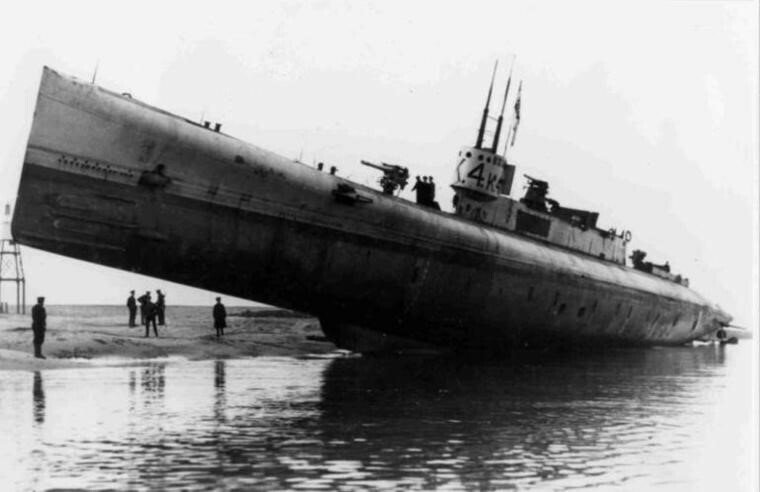 At 2036 hours, K-6 struck K-4, slicing her almost in half, and as K-6 detached herself from the stricken submarine K-4 sank almost immediately, with the loss of all the crew (59 men – 6 officers and 53 ratings). Of the crew of K-17, only nine men survived – the escaping crew were inadvertently mown down in the ensuing chaos by the destroyers escorting the fourth flotilla. The wrecks of K-4 and K-17 were surveyed in 2011, to ensure that they could be left undamaged should a proposed wind farm be constructed in the area. They lie about 100 metres apart and 50 metres down on the sea bed. Edward records his mother on both his Army and Navy service records as Mary Graveling, of Duckers Beck, East Dereham. Mary Wilhelmina Leeder was born in 1878 and baptised on the 28th December 1879 (along with her sisters Lucy Ann and Eliza Lydia) in Swanton Novers parish church, the daughter of William and Eliza Leeder. Mary married Alfred Graveling in 1899, and by the time of the 1911 census for Wood Norton they had eight children (4 boys and 4 girls). Alfred died in 1930 aged 53; Mary died in 1946, with her age recorded as 66. It is not clear whether Edward lived with his mother after her marriage to Alfred Graveling. In the 1901 census for Swanton Novers, Mary and Alfred Graveling are living in The Street, Swanton Novers, with their two small children, Lucy (aged 2), and William (9 months), together with a lodger (a young man of 20, George Porter from Ely, a blacksmith’s striker so perhaps a worker on the nearby railway works at Melton Constable) – but not Edward. Edward (aged 4) is recorded in the 1901 census with his grandparents, William and Eliza Leeder, in Giles Road, Swanton Novers. In the 1911 census for Swanton Novers, Edward (aged 14) is recorded in the household of his aunt, Elizabeth Louisa Bullen, rather than with his mother in Wood Norton. Elizabeth Louisa Leeder was Mary’s older sister, who married William James Bullen in 1889. The census records Edward’s name as Edward Bullen Leeder, and he is a ‘mother’s helper (at present)’. Sometime between 1911 and 1914 Edward moved from Norfolk to Blyth, Northumberland to take up the occupation of miner. It is worth noting that Edward was not the only serviceman with Wood Norton connections to have enlisted in the northeast – Thomas Charles Colman (Nicholas Robert Colman’s brother) was living in Blyth (Rotherham) when he enlisted in Newcastle upon Tyne in May 1916. Exactly why men from rural Norfolk moved so far away, presumably for work, is unclear and would bear further investigation. The official papers and the subsequent Court of Inquiry into the incident, held in early February 1918, were not released until 1994, by which time all the survivors had died. Despite the secrecy surrounding the incident, the King (George V) had been fully briefed, and in a letter he wrote to Admiral David Beatty on 12th February 1918 he expressed his distress at the ‘deplorable accident which has just occurred to the K boats in which two were sunk and four others damaged beside the loss of valuable trained officers & men’. His is the only expression of regret at the loss of life that is recorded. For a full account see N.S. Nash, K Boat Catastrophe: Eight Ships and Five Collisions – The full story of the ‘Battle of the Isle of May’ (Pen & Sword Maritime; 2009), especially Chapter Three (pp.52-71). N.S. Nash, K Boat Catastrophe: Eight Ships and Five Collisions – The full story of the ‘Battle of the Isle of May’; pp.87-88; p107 (Pen & Sword Maritime; 2009). This entry was posted in Local collections and tagged K-4, Kalamity, submarine, suicide club, Swanton Novers, Wood Norton Heritage Project. Bookmark the permalink.